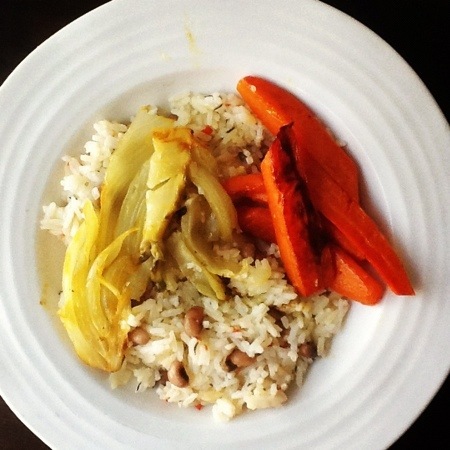 Nigella Lawson’s Rice and Peas with Roasted Carrot and Fennel | One Picture, A Million Words. If you had asked my husband a few years ago whether he would ever contemplate having a vegetarian meal, he would have balked at the idea. You see, he was raised on family dinners where meat took centre stage and vegetables got relegated to the obligatory serving on the side of the plate. That means that while the meat part of the meal was always given forethought and elaborately prepared (barbecued burgers, grilled lamb or veal chops, roasted chicken thighs), the vegetables were almost always given the same careless treatment, which is to say, steamed and served as is. Second helpings of boiled cauliflower, anyone? But things changed after we got married and I assumed the responsibility of cooking dinner for us. And things changed even more after our daughter gave up eating meat and fish. Now, we go meat free at least four days a week. Part of the reason for this lifestyle change is health. The major reason, however, is because I am adamant on not cooking different meals to suit differing or picky taste buds. I firmly believe that we should all be sitting down to the same meal. And as long as I am not serving brains or innards, I don’t allow anyone to push their food away without taking a bite! For tonight’s dinner, I made Nigella Lawson’s Rice and Peas from her latest cookbook, Nigella Kitchen, as my main dish and roasted some carrots and fennel to go with. Nigella made the rice and peas to go with her Jamaican Jerk Chicken. But I made her intended side dish as the star of my meal instead. It was very delicious. The coconut milk did not overpower the entire dish as it is apt to do. I kept the vegetables simple by roasting them with the juice of a clementine, a few crushed cloves of garlic and some olive oil, salt and pepper. A very tasty meal in all.